Bun Rieu Nha is the perfect place to sample some of Vietnam’s most delicious street delicacies, which have remained under-the-radar for far too long. 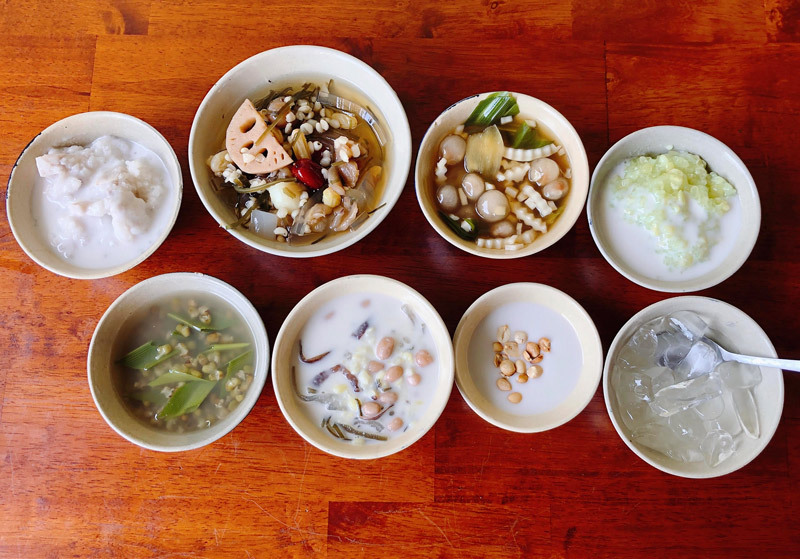 Located in Saigon’s bustling District 1 and a mere 150 metres walk from the vibrant backpackers’ and nightlife streets Bui Vien and Pham Ngu Lao, truly tantalising local flavours are literally a hop away. Bun Rieu Cua is a rice vermicelli noodle soup made with whole freshwater crabs. The protein essence from the crab rises to the top of the broth during the cooking process, and this delicious and savoury layer of crabby goodness is known in Vietnamese as rieu. The addition of tomatoes is also an important component in an impeccable bowl of bun rieu cua, adding a light yet unprovoking tangy touch to complement the addictive broth. This contrasts heavily with Vietnam’s most popular soup dish, pho, through a broth that is based on the natural sweetness of seafood instead of beef or chicken. Bun rieu also contains no five-spice; an important component of the famous pho aroma. 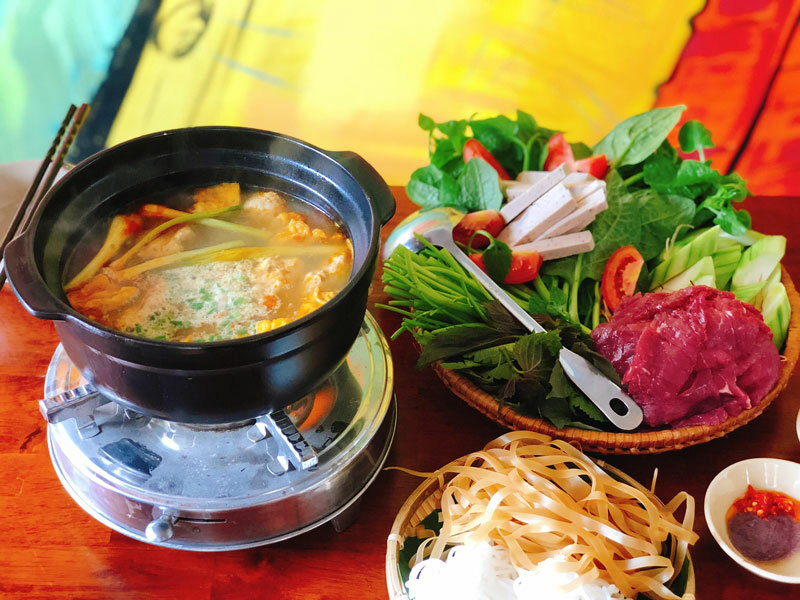 At Bun Rieu Nha, guests can enjoy tasty traditional food in a casual environment, which combines a rustic wooden setting with a touch of modernity. During typical lunchtime hours, young, local office professionals fill most of the seats at the restaurant; a good sign of great taste and authentic Saigonese cooking. Bun Rieu Nha’s team of waiters and waitresses include a good number who can communicate in English, ready to assist foreigners who may be sampling this dish for the first time in their lives. Bun Rieu Nha’s signature bowl of Special Bun Rieu features al-dente, medium-sized rice vermicelli, crab, shellfish and a sizable cut of melt-in-the-mouth pig trotter and Hanoi-style tofu, which is best enjoyed with a customisable dip containing shrimp paste, chilli, lime and a small serving of sugar. Smaller options are also available with only shellfish and/or crab. Guests who desire heat will be pleased by Bun Rieu Nha’s homemade Vietnamese-style satay chilli sauce, which is fragrant but be warned - very spicy! If noodle soup is not your thing, be sure to try the special deep-fried, square spring rolls stuffed with an irresistible mix of minced pork, shrimp, crab and carrots for added crunchiness. 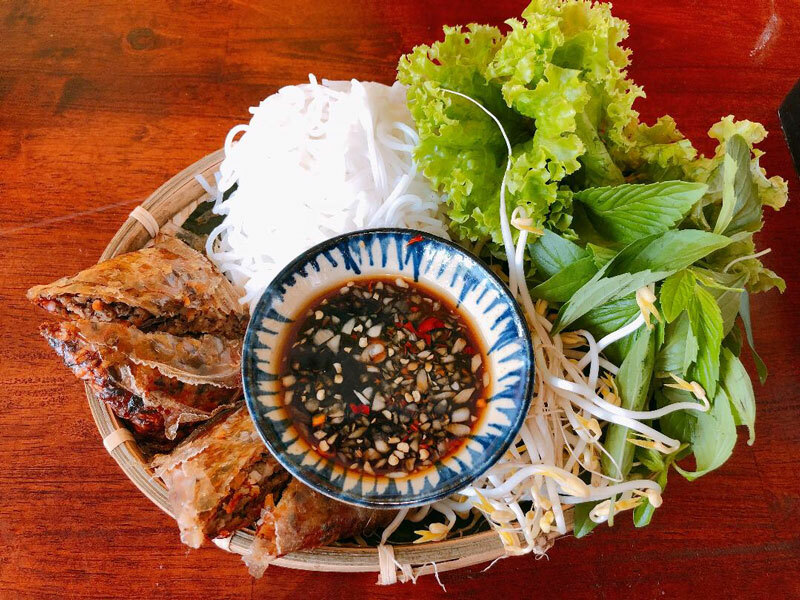 These rice paper spring rolls are served with vermicelli, fresh vegetables and a tangy dark sauce. As with many Vietnamese classics such as bun cha and bun thit nuong, this dish is best enjoyed tossed together in a bowl for a symphonic burst of flavours. For hungrier or larger crowds, Bun Rieu Nha offers a hot pot where guests can dig in together for an Asian do-it-yourself party vibe. Beef shank, Vietnamese pork roll and an assortment of vegetables are cooked in Bun Rieu Nha’s signature crab broth. When the broth grows richer in flavour with the help of the ingredients that are being added, be sure to soak up all the goodness with a serving of rice vermicelli or Hanoi-style banh da, flat rice noodles. Guests who are looking for a light, yet exciting, option may opt to try the Nom Cuon rolls, a culinary innovation that is unique to Bun Rieu Nha. These large summer rolls, stuffed with root vegetables, green papaya, eggs, pork, toasted rice powder and various herbs are served with an irresistible tamarind and peanut based dipping sauce. Vegetarians may also opt for meatless and/or eggless Nom rolls. Another equally delicious and exotic side dish is Bun Rieu Nha’s Northern Vietnamese style steamed escargots stuffed with minced pork and mushroom, which are served with a homemade, sweet, preserved ginger sauce. Last but not least, Bun Rieu Nha’s wide selection of desserts are homemade on a daily basis. The popular sweet corn congee made with glutinous corn, coconut milk, rock sugar and pandan leaves is an indulgence for anyone with a sweet tooth. Healthy drink options including lime juice with chia seeds and black jelly drink with chia seeds are also a great pairing with Bun Rieu Nha’s traditional cooked delights. Owner Ms Yen is a self-proclaimed fan and addict of bun rieu. She decided to open Bun Rieu Nha because she struggled to find a stall that served a bowl of bun rieu that was equally tasty and hygienic at the same time. This classic dish is mostly found on the street, sold by local vendors. It is exceptionally rare in restaurants perhaps for the simple reason that it is traditionally known as “street food”. Ms Yen shared her vision with us: to serve high-quality, healthy and delicious Vietnamese street cuisine in a clean, comfortable setting at reasonable prices and at a highly-accessible location to locals and foreigners alike!